MSSC, a division of Mitsubishi Steel Mfg Co., Ltd has a mission to grow to a World Class provider of automotive suspension components and systems to the automotive industry. They offer innovative solutions, zero-defect quality, 100% on-time delivery, cost competitiveness, and global reach. 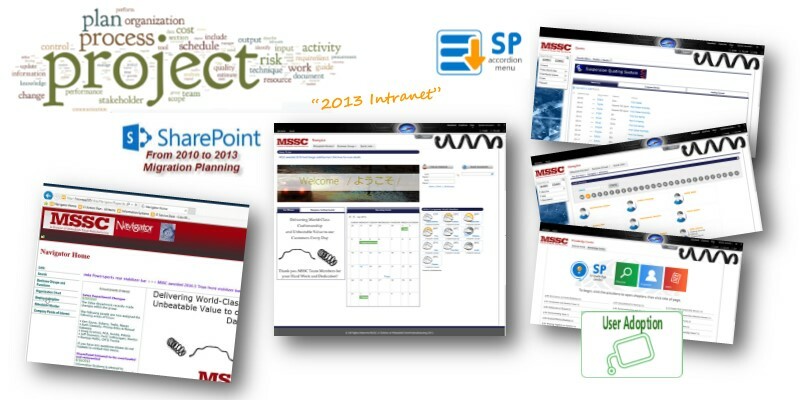 MSSC had SharePoint 2007 and 2010 farms running on premises. Both were installed improperly and had a variety of issues. The goal was to migrate both farms to a new SharePoint 2013 farm, retaining all content, site design, forms, and migrate existing workflows. All with zero business interruption. We performed a deep assessment of the older farms, remediated existing issues, retracted solutions that were unused or incompatible with 2013. We planned a merged information architecture for the new platform. Applied custom branding to be similar to their public site "look and feel". Greatly enhanced information architecture and navigation via our custom web apps (Mega menus, simple tabs, welcome banner, and more). Began merging and redesigning information architectures starting with smallest sites using rigorous QA, and the tackling giant site collections that were mission critical. Began replacing "kludgy" dashboards with a modern methodology for better user experience and increased data in site. A zero business downtime cutover was seamless. Users were on the old portals at the end of the day Thursday and on the new portal at the start of business Friday morning. Ongoing enhancements have replaced older lists with modern dashboards, and IA cleanup is ongoing to restructure many sites collections into a more manageable hierarchy. A close relationship was made with MSSC and to provide ongoing support a SharePoint Managed Services agreement was made. If your portal that all of your company's work is done through, is down for a day. That's basically a day of no work. That's why you want to make sure you're using the best Microsoft SharePoint consulting service so that there's no loss of business time and no surprises. Please read more about our zero business outage SharePoint migrations here and contact us today!